One barrier to healthier eating is the cost of quality, fresh foods. 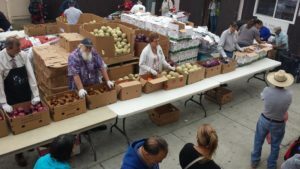 Push Produce is a weekly program supported by Second Harvest Food Bank to provide free quality produce and promote healthy eating for low income families and individuals in our community. We distribute an average of 30,000 pounds of fresh produce to 600+ families each week.